Got its start before 1900 with Thomas Jefferson “Captain” Renfrow, a mining engineer. Renfrow came to Matthews after the Civil War and opened the Rea gold mine — once located near the intersection of Sardis Road North and Monroe Road. A movie theater is built upon one of the mine shaft’s openings. As the mine became successful, Renfrow purchased farmland and oversaw a flourishing cotton farm, later becoming a cotton ginner and broker. 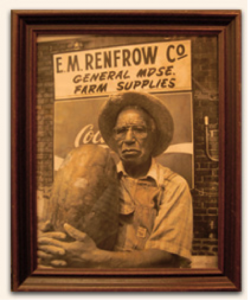 Renfrow began ginning cotton in 1906 and at one point had four gins operating in one building. Thanks to its central location in ‘downtown’ Matthews, the general store was a hub of activity in the growing community. Matthews farmers purchased their supplies from Renfrow on credit and paid the bill in the late fall, when they brought their cotton to Renfrow for ginning. Families would then purchase their seed, fertilizer, groceries, clothing, and hardware — again on credit — and would hopefully be settled up by Christmas. This way of life continued virtually unchanged until 1965, when the last bale of cotton was ginned, which you can see in the store today. Captain Renfrow had several sons; one, Eugene McDowell “Dow” Renfrow, remained in the family business of farming and selling. Henry Massey, Dow’s nephew, was his assistant for nearly forty years. Dow’s son, Franklin, began working in the store after graduating from college and maintained control of the business until 1984. Throughout the years Matthews grew from a rural agricultural community to a thriving suburb of Charlotte. Single-family housing developments were built on what was once farmland. Supermarkets, malls, and large department stores replaced country stores, and automobiles became the primary mode of transportation. Improved roads and curiosity caused residents to travel away from downtown Matthews. 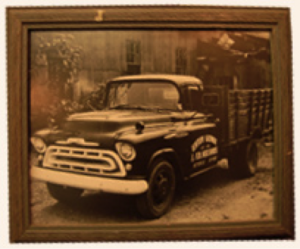 Frank was the last surviving Renfrow and in 1984 he sold the family business to Charlotte native and family friend, David Blackley. Shortly before the Captain opened the doors of his store, the population of Matthews was less than 200 people. Today, the town is home to almost 30,000 residents and is no longer just a suburb of Charlotte. Blackley continues to serve the needs of the community, now made up of many home gardeners. The store’s mainstay is still farming and gardening supplies and if it can grow in the ground, Renfrow probably has the seeds. The newest chapter to the business came about with the start of Renfrow Farms in 2011, also located in downtown Matthews at 409 W Charles Street. David’s daughter Pressly joined the business full-time and manages the farm in addition to managing the seed counter and greenhouse at the hardware store. The farm is a natural extension of Renfrow’s specialty of farming and gardening supplies, and offers a venue for teaching gardening classes, hosting community events, and keeping a bit of Matthews’ farming roots alive. Stop by and see us, we love to make new friends! Produce availability, general farm news, gardening product updates, gardening class announcements, gardening tips, Renfrow community news, & more! In your inbox once-weekly!